With all my sewing patterns, especially patterns for clothing I never cut the patterns out from the manufacturer as I might want to do a different size or style in the future so I keep them all intact. 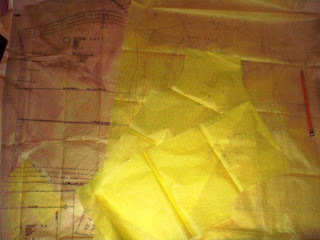 I use tracing paper to trace the originals and have also used tissue paper which is even cheaper in price and works just as well. I keep them stored in Ziploc bags or small envelopes clearly marked. For patterns I use on a regular basis for my business I buy the big poster boards and trace the patterns out on them which keeps the patterns very sturdy and easy to trace on to my fabric.